WiBOX PA MMB0727-8X N is antenna predicted for 4G LTE mainly, but is compatible with 3G and 2G as well. working frequency range, the antenna is universal client side station for LTE bands like LTE700/800/1800/1900/2100/2300/2600 (including new 800MHz frequency using for LTE). Due to small dimensions, aesthetic look and highest quality, the system can be installed in any location, even for the most demanding customers. WiBOX PA MMB0727-8X NF can operate indoor and outdoor (IP67). The antenna is integrated with the top quality WiBOX Medium. 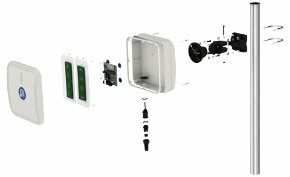 It comes with 2 x NFemale panel mount outdoor connector.